I organized an impromptu gaming event at my house for a small group this past weekend. We didn’t finish up until almost 2am so although that may sound horrible to non-gamers…it was an awesome afternoon and evening of gaming. We took a break and walked a couple of blocks to Chipotle for dinner but other than that…the gaming was on! Rich arrived a little late so we set up one of my favorites Tigris & Euphrates. 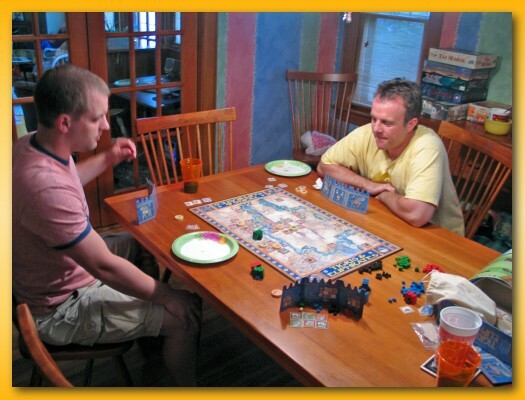 Jason was new to the game and Bob had only played once but it didn’t take us long before play was under way. Bob was really into introducing chaos into the mix by repeatedly causing external conflicts between Jason and I and since I was sitting to Bob’s left I was always the attacker. Arg! The sweetest moment of the entire game was when Bob triggered an external conflict in blue with Jason and ponied up 5 blue tiles to Jason’s zero. Jason, having just swapped away 5 blue tiles on his turn just before Bob’s attack managed to tie the attack because the managed to draw 5 more blue tiles in the swap. 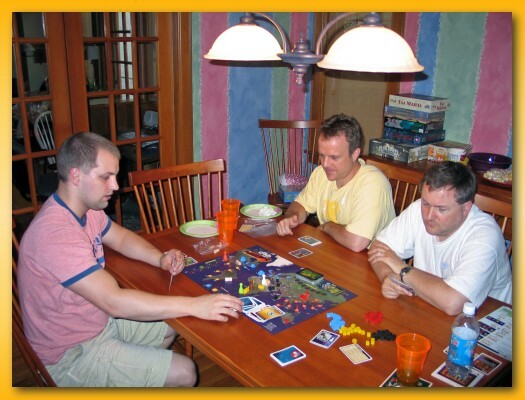 Next up we played Pandemic at the “medium/normal” level. This was my first playing and I found it a pretty good game. 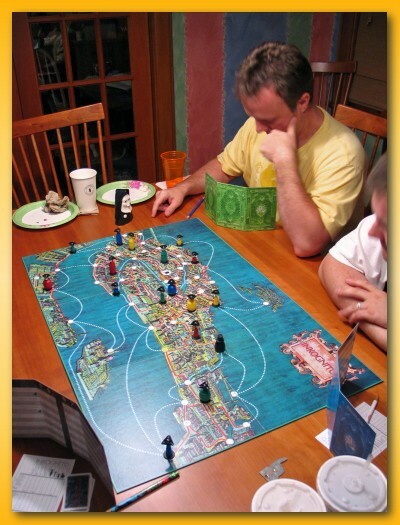 Pandemic is different than all the games I own because it’s a cooperative venture. All players either win or all players lose. You work together as a group to beat the game. The theme is appealing since everyone wants to stop the spread of disease across the globe and the rules are easy to grasp. It’s going to be tough for me to pick up a copy since the game is in such high demand and the number of printed copies tends to be pretty low. There is a restock coming in July so maybe I’ll jump on the bandwagon then with a portion of my $100 gift certificate from Father’s Day. After the Chipotle run we settled in to Reef Encounter. It’s been years since I’ve played but since we only had four players I wasn’t going to squander a great opportunity to get it back to the table. Unfortunately, the rules are a bear to get through. I was prepared to teach the game having studied the night before but the circular nature of the actions and their ramifications can make it mind numbingly complex for new players to grasp what makes a good move. Unlike many games each action is simple to grasp you gives you few clues on why you’d want to make any of them. However, the power is in understanding how best to stack your actions so that a seemingly uninteresting move can position you better to make a subsequent move later in your turn. I greatly enjoy the game but it is a brain burner and suffers a bit from analysis paralysis. You can somewhat plan your move when it’s not your turn but by the time it gets back around to you…a lot can happen to completely destroy even the best laid plans. And finally, we closed the night with the first playing of my copy of Inkognito. For non-gamers, the game is Clue on steroids. By that I mean, the game holds hidden information and your job is deduce information based on knowledge you learn during game play. The game ends once you know the secret information and can attain the secret goal. I’ve played the game in other venues four times and have enjoyed it every time. I think everyone at the table had a good time and I can’t wait to inflict it on my sister’s family in the next few weeks when we head back to Indiana for a wedding. Thanks for coming guys, it was great. I’ve been in backorder hell at Game Surplus. My copy of Rails of Europe (a Railroad Tycoon expansion) and Galaxy Trucker won’t be restocked until some time in July at the earliest. These copies were holding up my copy of Oasis, an Uberplay title that I wanted to obtain before they became scarce (Uberplay recently ceased operation) and Amyitis. So after waiting a month, I decided to have them split the order and since my 43’rd birthday recently passed I threw in a copy of Inkognito and El Capitan. I played Inkognito at CABS and always desired a copy because it’s a completely different kind of game than I have in my collection. It’s a deduction game where two players (eventually deducing that they are partners) either win or lose to the other set of partners. Plus, it’s got the Nunzilla piece. Who can pass that up?! El Capitan was a title that wasn’t particularly on my list until I saw it was in stock at Game Surplus, I recognized it had had an artistic face lift by Mike Doyle, it has some neat mechanics, a great theme, and was rated highly at BGG. My opportunities for gaming have been pretty slim lately so I was happy for June AGN to arrive. Paul was gracious enough to host so Paul, thanks for that. Your wife gave me the, “what a weirdo” look and asked “you’re taking pictures of a board game?” but phooey on her…what does she know. Tim, our fifth, was going to be arriving late so we started with Zooloretto for four. Rich has owned a copy for quite awhile but I’ve just never had the opportunity to play it. Zooloretto is a light filler but not mindless. Like its parent game Coloretto, players place tiles drawn from a pile into groups, the trucks, in the middle of the table. The tiles represent vendor stalls, various animals, and money. 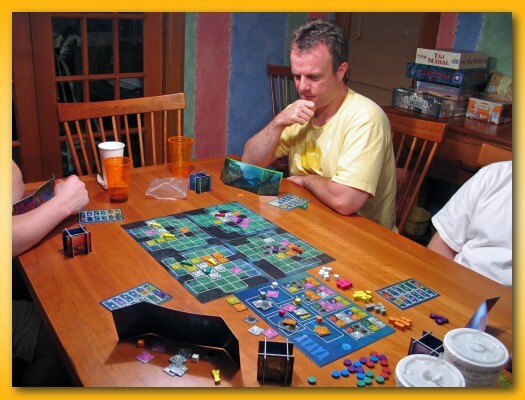 Players can draw and place a tile, take a truck (along with it’s tiles), or execute a monetary action. Rinse, lather, and repeat until the game ends and the player with the most points after the scoring wins. The goal is to gather trucks holding vendor stalls, animals, and money such that you can place the animals in exhibits in your personal playing area (the zoo). Exhibit space is limited and only one kind of animal can exist in single exhbit at a time. You’re trying to fill all of the exhibit spots with the correct number of animals (no less and no more) to maximize points. Vendor stalls mitigate risk of not filling an exhibit space and provide additional points at the game end. Money is used to execute monetary actions while you’re still in the round before you’ve taken a truck. Some additional rules further deepen (complicate?) the game such as: you can buy one additional exhibit space, you can use the barn in your zoo as ‘swing’ space if you need to restructure your exhibits, you can ‘purchase’ an animal from somebody else’s barn, etc. If you like Coloretto you’ll be very comfortable playing Zooloretto. It’s a slightly deeper experience but by no means brain burning. 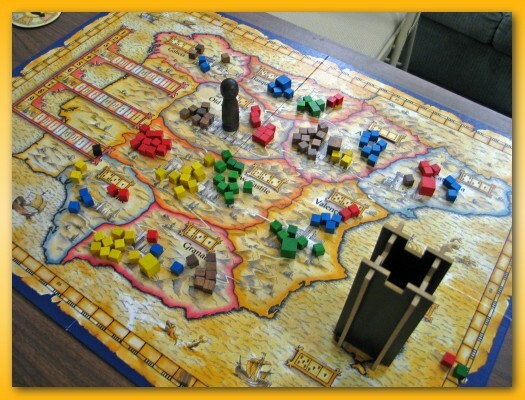 I started to teach Tichu but before we got started, Tim arrived and we settled on an oldie but a goodie, El Grande. 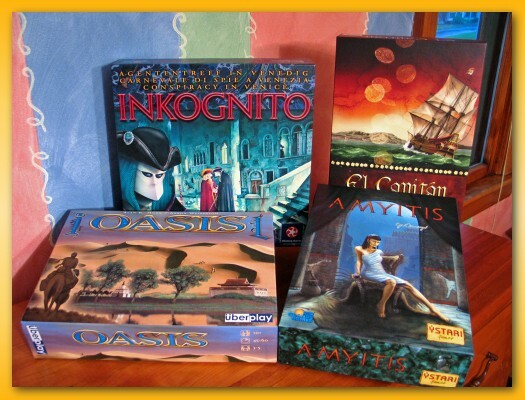 I went looking back in the blog and found that the last time we played El Grande was the November AGN in 2004! I’ll not go into details but suffice it to say that I did so poorly that I can hardly stomach the thought of it. It’s been long enough since I’ve played that the chaos factor of the action cards continually caught me off-guard. You can be so devastated by how those cards are played by your opponents. I repeatedly felt stuck in the situation where I wanted to go early in the round to get a sweet card yet if I went early I’d just leave the door open for a later card to sweep in and negate my move. I’m finding that when I do poorly in an area control game, whether it’s Mission: Red Planet, Mexica, Tikal, El Grande, etc., I’ve consistently done a poor at choosing my opponents. My biggest fault is choosing to fight too many different opponents simultaneously. I end up getting ‘picked on’ from all players weakening my position on all fronts. If I instead, focussed on only fighting a select few opponents then some will ignore me allowing me more resources to strengthen my position. It seems pretty obvious but I consistently fail at recognizing that I’ve done it yet again. I’d not remembered the chaotic back-stabbing romp that makes up El Grande but it is a good game. It’s a shame that it has taken us 3.5 years to play it again. I’d like to play it again soon and I promise to myself to choose my battles more wisely.